The Victoria Independent School District (VISD) serves Victoria, Texas and some smaller adjacent communities. The VISD is the largest single employer with more than 2,400 staff members. The district educates more than 14,700 students. The VISD needed Windows email servers capable of handling several thousand users, both staff and students. Ease-of-use, economy and performance were the primary selection criteria. 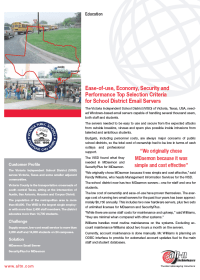 The VISD found what they needed in MDaemon and AntiVirus for MDaemon, “We originally chose MDaemon because it was simple and cost effective” said Randy Williams, who heads Management Information Services for the VISD.